Huge Savings Item! Save 17% on the Lillian Rose Mr. Mrs. More Aqua Blue Matching Luggage Tags by Lillian Rose at SCRHI. MPN: TR640 MM. Hurry! Limited time offer. Offer valid only while supplies last. Lillian Rose 4.8''X2.75'' Mr., Mrs. & more Mrs. Aqua luggage tags. 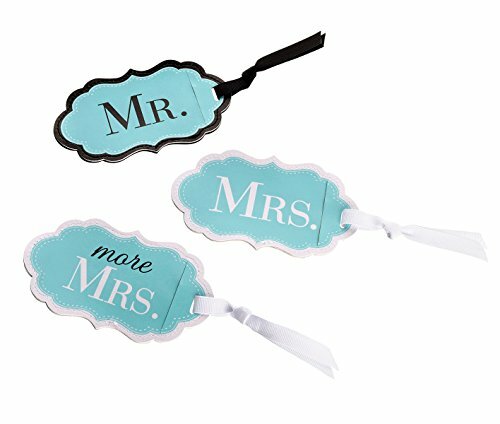 Make your luggage stand out with these 3 Aqua luggage tags for the Mr. And Mrs.
Lillian Rose 4.8"X2.75" Mr., Mrs. & more Mrs. Aqua luggage tags. Make your luggage stand out with these 3 Aqua luggage tags for the Mr. And Mrs. LUGGAGE tag measures 4.875" x 2.75". on the flip side of each tag is a clear window with an I.D. Card to be filled out. The card gives room to fill in your name, address, phone and email.